Deadeye's explanation of how the pistol grip stocks were made for the later, non military rifles shows how great the workmanship was at Mass. Arms. Another thing I always marveled about is how the carbine barrels were cut off forward of the lug, breech bored out and sleeved with the stub of a new barrel. Good machinists of today can do it, but we are talking about the 1880's here! I have three #16s that were originally carbines, one was a Model 1 and two were Model 2s. You have to look close to see the joint, but it's there. Another barrel I have has no joint and the breech face shows no trace of a sleeve being brazed into it. So...I assume this was a "new" barrel.(?) I guess my question is: Was this done by Mass. Arms Co. or is it an entire barrel made and installed by Stevens after they acquired Mass. Arms? Did Stevens ever convert carbines to civilian rifles? Not a whole lot of factory info available on the Maynard. But they are fasinating. 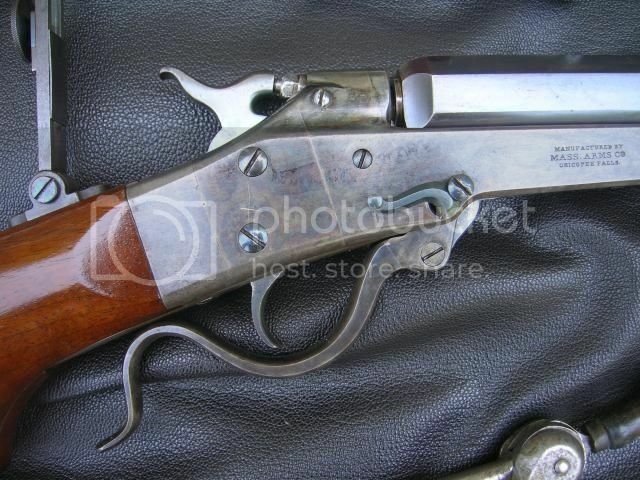 .....Another thing I always marveled about is how the carbine barrels were cut off forward of the lug, breech bored out and sleeved with the stub of a new barrel. I have three #16s that were originally carbines, one was a Model 1 and two were Model 2s. Another barrel I have has no joint and the breech face shows no trace of a sleeve being brazed into it. So...I assume this was a "new" barrel.(?) I guess my question is: Was this done by Mass. Arms Co. or is it an entire barrel made and installed by Stevens after they acquired Mass. Arms? I too have admired Mass. Arms sleeving work, and have wondered about why some barrels were sleeved and some weren't. Simple conversion from M-1873 thick rim cases to standard 1882 cases seems frivolous for such a major process...? Would you please post photos illustrating the differences between your #16s made from #1 and #2 Carbine frames? The smaller calibers, 32 and smaller were made up on surplus carbine barrel stubs. The extension of the barrel that came all the way to the breech end was only 5/8" diameter. Larger calibers were made on on new barrels. All the 1882 models were made up on surplus carbine frames purchased back from the Gov't. That's why the serial numbers are all over the place. I don't have any proof but I think Stevens must have made up some of the 22 Long Rifle barrels. The Long Rifle came out in 1887 but was not in use much until 1888 and Maynard was on the tail end of their life. Long Rifle barrels were listed in the 1890 catalog. I do not know if you can tell the difference between a Model 1 frame and a Model 2 frame. What I was referring to in my previous post was the difference in the barrel breeches. Notice the different location of the dovetail plugs. The top rifle is 32-40 and the plug is where the Model 1 sight was removed. The lower rifle is in 32-35 and the plug is where the Model 2 sight was removed. The second picture is a rifle in 35-40 which has no plug so this must not have been a carbine breech, but a new complete barrel. This seems to corroborate what Deadeye just said about the smaller calibers being made from carbine barrels. Another interesting question I have concerning the pistol grip stock models is what determined the shape? Some have the "roll of fat" and some don't. That is not necessarily a 1st Mod barrel. That filled dovetail seems more likely to have been for a scope mount of some sort. 1st Model frames were made for the Maynard tape primer and have the door to cover the pocket for the roll of primers. Here's the only picture that I have ever seen of a 1st Mod converted with an 1873 hammer that seems to be a factory conversion. I've seen some Rube Goldberg conversions. Deadeye is correct. I always assumed the rear sight was near the breech on the Model 1 carbines. This picture shows illustrates it well. Page completed in 1.3984 seconds.